The Maine Department of Marine Resources acquired the Burnt Island Light Station in 1998 as part of the Maine Lights Program. Education Director Elaine Jones, her assistant Jean McKay, local contractors, and hundreds of volunteers transformed it into a remarkable educational and recreational facility for the people of Maine and the nation. On June 30, 2003, an educational program called the Burnt Island Living Lighthouse opened to the public. The light station’s beautifully restored keeper’s dwelling serves as a “living” history museum where interpreters in period clothing portray the lighthouse family of Joseph Muise. During the final segment of the tour, visitors climb the winding stairs into the lantern-room; view the historic photographs and documents in the covered walkway museum; sport-fish off the rocks; or picnic by the waterfront. The Burnt Island Living Lighthouse is an exemplary model of the sustainable use and preservation of a cultural and natural heritage asset. Along the craggy shoreline, nature trails appeal to the outdoor enthusiast. Come explore the five-acre island’s habitats and discover the varied life found in and around the rocky shore, sand beach, meadow, and maritime forest. Marvel at the flora and fauna indigenous to Maine’s coast, as well as the geological features of this picturesque island. Keeper Elaine Jones painting the lighthouse. AmeriCorps volunteer removing ceiling tiles. Master gardeners make raised flower beds. Former Keeper's son repairing his old home. School children, Maine residents, artists, and cultural tourists are drawn to the Boothbay region for an unparalleled, lighthouse experience that has been rated by some visitors as the "best in the nation." A dock and moorings provide recreational boaters and kayakers public access to a unique piece of Maine's coastline. The island is open daily from 10 am to 5 pm, so bring a picnic lunch and enjoy the spectacular views from every direction. Burnt Island offers numerous recreational opportunities for families - from exploring the nooks and crannies of the five-acre island to catching a striped bass off its shore. Recreational boaters stop by for a break or to enjoy a picnic lunch. Artists and photographers capture the beauty of the lighthouse, while the young and the young at heart have fun on the tire swing. The non-profit organization “Keepers of the Burnt Island Light” will be hosting several fundraising events to pay for the restoration of the Burnt Island Lighthouse and exterior of the keeper’s dwelling. Please help them honor its 200 years of service and help preserve it for future generations through a donation and/or by attending fundraiser events. On May 25, 1821, the United States of America purchased the five-acre island for $150 from local residents Jacob Auld and Joseph McCobb. This ended its use as sheep pasturage and Burnt Island was never to be burned over again. At sunset on November 9, 1821, Keeper Joshua B. Cummings lit the 10 Lewis Patent Reflector lamps for the very first time. These lamps were replaced in 1857 with its first Fresnel lens – a 4th order, classical, beehive-shaped lens that produced a solid white light. In 1889 the lighthouse’s signal was changed to a flashing light by the installation of a square, bullseye lens. The purpose of this change was to differentiate it from the newly built Ram Island Lighthouse. When the station was electrified in 1961, a 375mm lantern buoy lens was installed and today an acrylic Fresnel lens is in place creating a flashing light, once every 6 seconds. In 1857, a granite keeper’s dwelling was replaced by a 1.5 story, wood-frame cottage, connected to the lighthouse by a forty-five foot long covered walkway. This dwelling still exists today with upgrades that included the addition of a front porch and dormers. On June 19, 1895, a party of workmen arrived at the station to build a bell tower. It took them two days to complete the thirty-foot tall, wooden, pyramidal structure. About a month later, the sloop Ajax landed the 1,029 pound bell that provided mariners with a fog signal for the next sixty-six years. With the arrival of electricity in 1961, the bell tower was razed and a smaller bell was placed at the base of the lighthouse. Today, a foghorn powered by solar energy provides the signal. 1988. 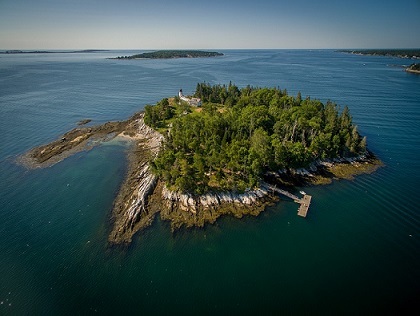 Ten years later, the Department of Marine Resources acquired the property as part of the Maine Lights Program, a transfer of 28 lighthouses to new owners. It presently serves as an outstanding educational and recreational facility for the people of Maine and the nation.